Welcome to the first week of Advent, a time of waiting and preparation as we prepare for the birth of Christ. This week you will light the first purple candle, the candle of prophecy and hope. The light of the prophets reminds us of the hope that God gives us on the way to Bethlehem. Therefore, we light the candle of Hope/Prophecy during the first week of Advent. There are many prophecies that foretell the birth of the Messiah in the Old Testament. In the Gospel of Luke, Elizabeth and Zechariah, the parents of John the Baptist, prophesy about the Messiah as well. As the mother of John the Baptist, Elizabeth had already received a miracle. Unable to have children, she and her husband, Zechariah, were very old when the angel Gabriel visited Zechariah to tell him that they would have a child. And this child would be “great in the Lord’s eyes” (verse 15). In fact, he would prepare the way for the Messiah, pointing people in the direction of their Savior. When Gabriel visited Mary to tell her that she, too, would be expecting a miracle, he told her that nothing was impossible with God and that, in fact, her cousin Elizabeth, who had been unable to have children, was now pregnant as well. Mary quickly went to her cousin and when Elizabeth saw her, her child leaped in her womb and Elizabeth proclaimed, “God has blessed you above all women, and he has blessed the child you carry. Why do I have this honor, that the mother of my Lord should come to me? As soon as I heard your greeting, the baby in my womb jumped for joy. Happy is she who believed that the Lord would fulfill the promises he made to her” (Luke 1:42-45). Elizabeth’s recognition of Mary as the mother of the Messiah helps Mary believe even more that what the angel said was true. After Elizabeth’s child, John (the Baptist), was born, Zechariah also prophesied about the coming Messiah. Read Luke 1:67-79. Zechariah told the people that the Savior had come and that they would be rescued so that they could serve God without fear. He also predicted that Zechariah’s child, John, would be the prophet of the Most High and the one who would prepare the way for the Messiah. As Elizabeth, Zechariah, and all of the prophets said, the Messiah was coming, and he was bringing with him the hope of the world. 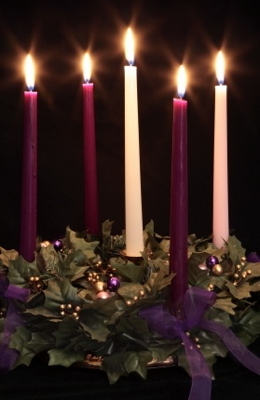 Today we light the Candle of Hope (the first purple candle). This candle reminds us of the hope that Jesus brought us. The Bible tells us that Jesus is the light of the world. He came to show us how to live, and to show us how to be forever friends with God. Because of Jesus, we know that God is always with us. Father God, thank you for sending Jesus to us. Thank you for the hope you give us. Help us to remember that Jesus is the light of the world. Help us to share the light with others. It’s in Jesus’ name we pray, Amen.